Woodbury Day School students D.J. Moore, left, and Maddie Reed "go green" by recycling their drink pouches. With scores of students eating lunch every day, the teachers at the Woodbury Day School used to see a lot of used drink pouches get thrown away. Now they earn two cents for every one of those pouches they collect and return to a company called TerraCycle, who uses their drink pouch waste to make affordable, eco-friendly products. 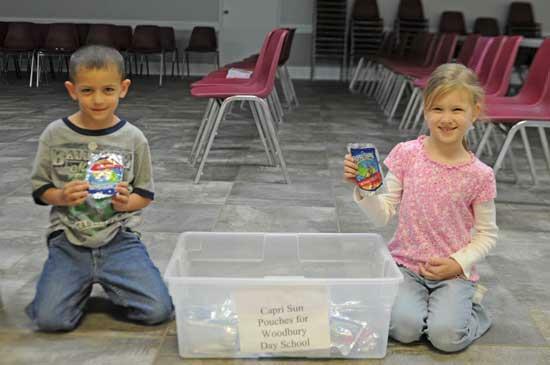 The Woodbury Day School is part of a free nationwide program called the ‘Brigades’ that pays schools and non-profits to collect non-recyclable waste that would otherwise go to landfill. Now the programs are coming full circle back to Woodbury through an exciting partnership with local Walmart locations. TerraCycle uses waste material to make a wide range of products like Seed Starter kits made from yogurt cups and pencil cases made from drink pouches, which will be sold at Walmart for the first time in honor of the 40th Anniversary of Earth Day this month! In fact, for a limited time Walmart is selling the widest range of TerraCycle’s ‘Upcycled’ products ever! For the month of April, TerraCycle’s products will be sold right next to original items, so tote bags made from Frito-Lay wrappers will be sold with bags of Frito-Lay chips and backpacks made from Capri Sun drink pouches will be sold next to boxes of the popular juice! This will help educate consumers about resource conservation and drive participation in TerraCycle’s program. Nationwide over 50,000 schools and community groups have signed up to help collect over 25 million used pieces of packaging. Through the TerraCycle Brigades school and non-profits will earn close to one million dollars this year! Any interested organizations can learn more or sign up for free today at www.terracycle.net.